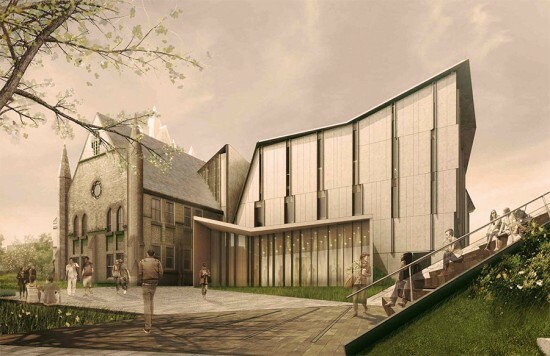 The University of Toronto recently revealed ambitious plans for One Spadina Crescent, a historic property with a 19th century Gothic Revival building positioned in the center of a roundabout. 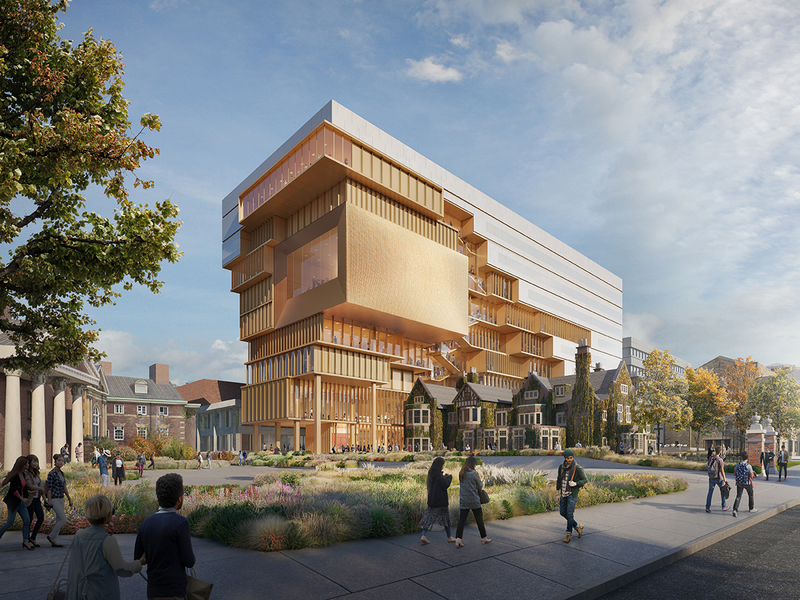 By next year, the site will be the University’s John H. Daniels Faculty of Architecture, Landscape, and Design. NADAAA, in collaboration with E.R.A. Architects, will restore the historic building and add a new wing with lecture and studio space, a library and a digital fabrication workshop. The project will supply state-of-the-art accommodations for architecture, art, landscape, and urban design students and professors. One Spadina has lived many lives—it was built as a theological seminary and was later a military hospital for World War I veterans, a factory for penicillin and polio viruses, and an eyeball bank. Now, NADAAA will transform the site into a new home for the University's Daniels Faculty of Architecture. Through a $50-million campaign (of which $24 million remains to be raised), the makeover will involve a contemporary addition to the north side, as well as pavilions and a public hall to engage the community. Plans include removing a fence that encloses the property and restoring pedestrian access. The main east-west corridor will serve as an extension of Russel Street. The addition's exterior will be composed of glass, stone, and steel and will conserve views of the building’s grand turrets. Within the irregularly shaped structure, openings allow natural light to enter the floors and rooms. A considerable amount of interior space, about 100,000 square feet, will receive daylight. The contoured roof will allow for rainwater harvesting. The restoration and addition are planned for completion in 2015. 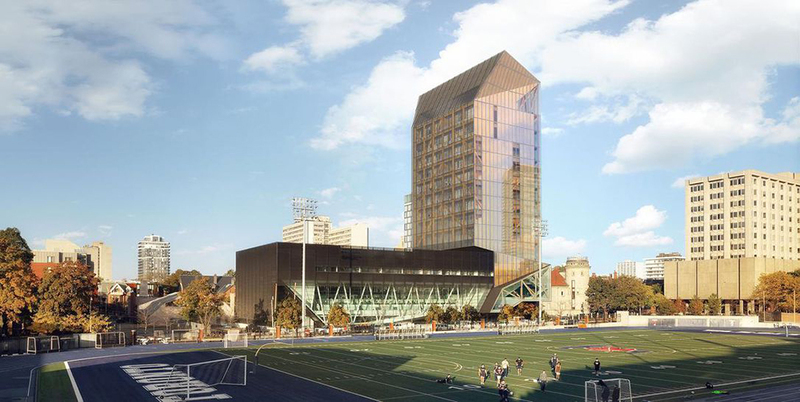 The University of Toronto Rotman School of Management’s nearly $100 million expansion project will more than double the size of the business school. A new 161,000-square-foot building designed by Toronto-based KPMB Architects mediates between its neighbors—a historic 19th century brick home on one side and the towering Brutalist Robarts Library on the other—while maintaining views to the medieval Oxbridge-style Massey College to the east. The architect’s solution to the architectural mixture is an elevated box made with floor-to-ceiling glazing punctuated by slivers of Ductal, a patented ultra-high performance concrete made by Lafarge. The building’s curtain wall is partly clad with more than 350 dark gray Ductal panels that are just 30 millimeters thick. Panels range from .5 to 1 meters wide by 3.5 to 5.3 meters high. An additional 100 panels, each only 19 millimeters thick, create an interior feature wall. The color and texture of the curtain wall’s opaque sections complement the black slate rooftops of several houses nearby. Fabricated by Ontario-based precast manufacturer Armtec, the panels were made with Ductal because of the concrete’s aesthetic quality and its ability to meet the structural requirements of a curtain wall application. KPMB’s challenge was to meet the university's request for a long, thin, lightweight span facade panel more than 5 meters tall, with a durable exterior surface. They hoped for a material that would show no signs of wear from the elements over time. Ductal could create a very thin, monolithic-plate, slab-type design with a custom-colored and molded surface that would also “plug-and-play” with curtain wall framing systems without intermediate jointing. The panels went through several iterations during the project’s mockup phase. Because Ductal was a fairly new material to Armtec, they studied its structural capabilities before developing the final panel manufacturing process and appearance. The final panel pattern and size is based on the need to keep the glass panels down to ±40 percent of the overall skin (due to energy performance criteria for LEED). The design also accommodates one operable window per office. The weight of the larger Ductal panels, along with the oversized unitized curtain wall panels, created some installation challenges during construction. Because the panels had a smooth exterior surface, the contractor was able to use vacuum cup lifters typically used with glass to install the panels. The technique allowed the smooth-panel fabrication processes to be maintained while keeping the project on schedule and reducing installation costs. Recently completed, the facade has added an appealing new face to the campus ahead of the building’s completion. When the addition opens later this year, the new structure will be fully integrated with the existing business school, allowing students to move through both buildings via several horizontal connections and a full-height atrium and staircase.